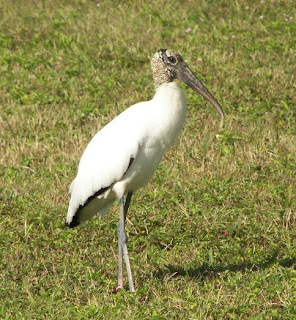 I've been trying to get a picture of a Wood Stork ever since we arrived - but every time I saw one we were driving along the road and Bill objected to stopping traffic so I could get a picture. 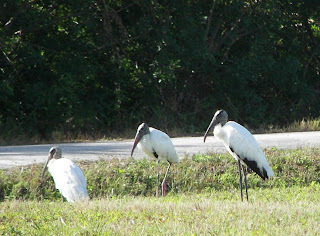 Yesterday, I was with my sister (who has a similar problem with her husband) and we were determined - so when we spotted three storks - we made a u-turn, parked her van on the side of the road, climbed over a fence - and got the pictures! 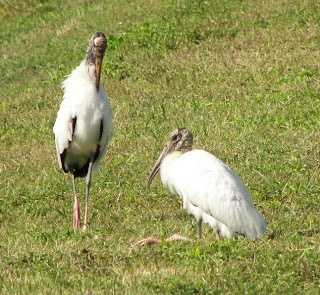 These are spectacular birds! 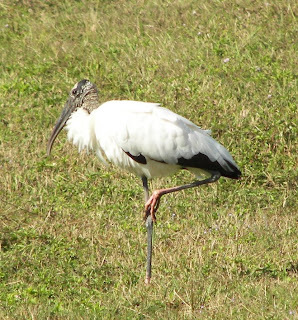 It was interesting to see them "sit" or stand on one leg - and just look at those beautiful wings when they fly! 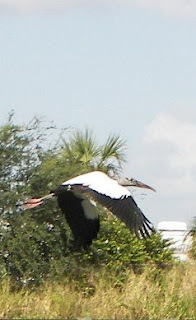 My sister Beth got even better pictures so be sure to check her blog when she gets a chance to update it.